I love Shrimp Boil. 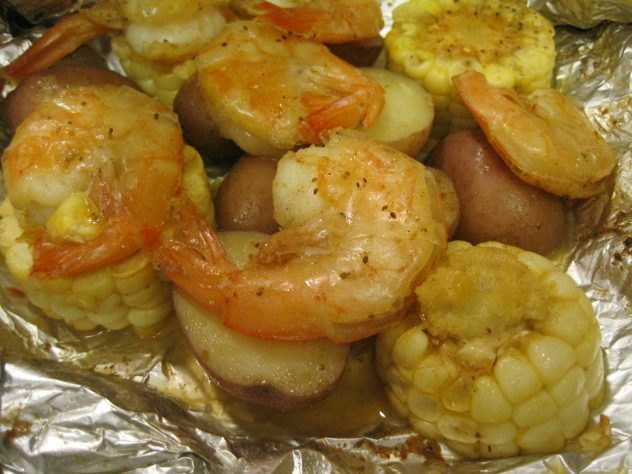 The first time I ever had it, my aunt, who was living in New Orleans at the time, brought shell-on shrimp and seasonings up to my grandmother’s house and made a shrimp boil for the family. For me, it was love at first bite. 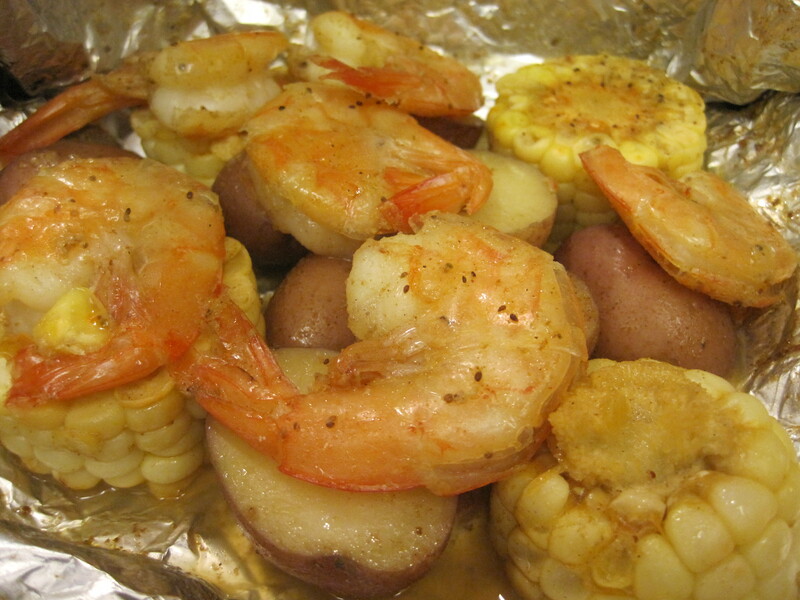 We make shrimp boil at our house from time to time, but this version is much easier. The foil packets are assembled and grilled for 10 minutes on each side. You have all the flavor of a shrimp boil without all the mess. It’s definitely a winning combination. All you need is a few pieces of foil. My pieces were about 12 x 18 inches. We put four small red potatoes and 1/2 ear of a large ear of corn. These were cut into smaller pieces. 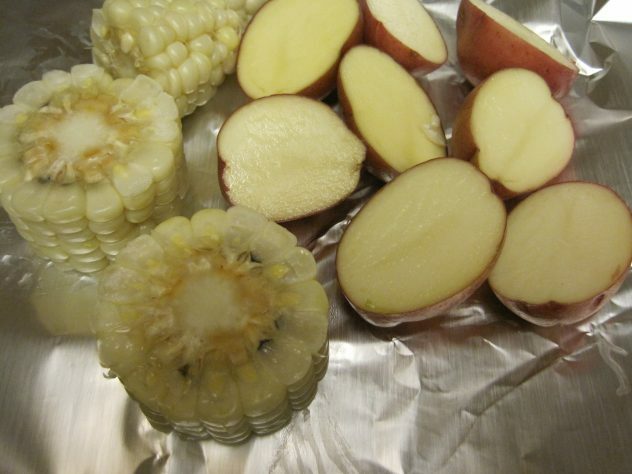 The potatoes were halved, and the corn cut into disks. Everything was sprinkled with 1/4 teaspoon of Old Bay seasoning and drizzled with a tablespoon of olive oil. Six frozen, medium to large sized shrimp were arranged on top of the vegetables. A tablespoon of butter was placed on top of the shrimp. Then, another 1/4 teaspoon of Old Bay was sprinkled on top along with 1/8 teaspoon of granulated garlic. 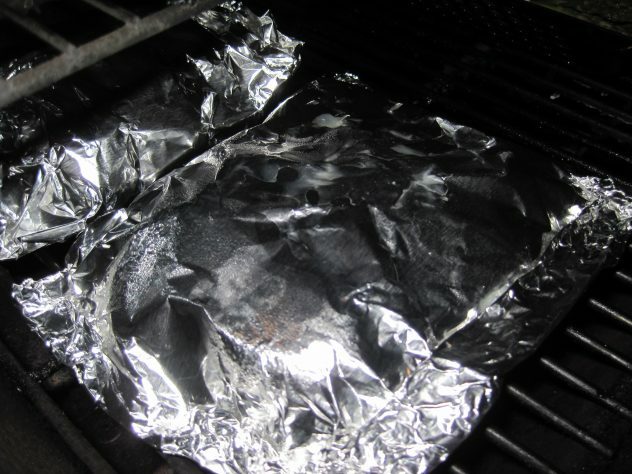 The foil pouches were securely sealed and placed on the grill where they were allowed to cook for 10 minutes per side. When they were removed from the grill, the pouches were placed on plates and allowed to sit for 5 minutes before being carefully opened. A great deal of steam will be trapped inside the packet, so open with caution. The escaping steam can cause burns. The end result was perfectly seasoned. The corn was thoroughly cooked, the potatoes tender, and the shrimp were perfect. This was a perfect summer meal, and Baker’s Man loved it. We will definitely be making this one again. Here’s the recipe. Give it a try and let us know what you think. This is a delicious and simple version of a Louisiana Shrimp boil that is ready in 30 minutes and has very little clean up. Perfect for a summer barbecue. Cut each corn cob into 8 pieces with a sharp knife. Drizzle with 1 tablespoon olive oil. Arrange 6 shrimp on top of vegetables. 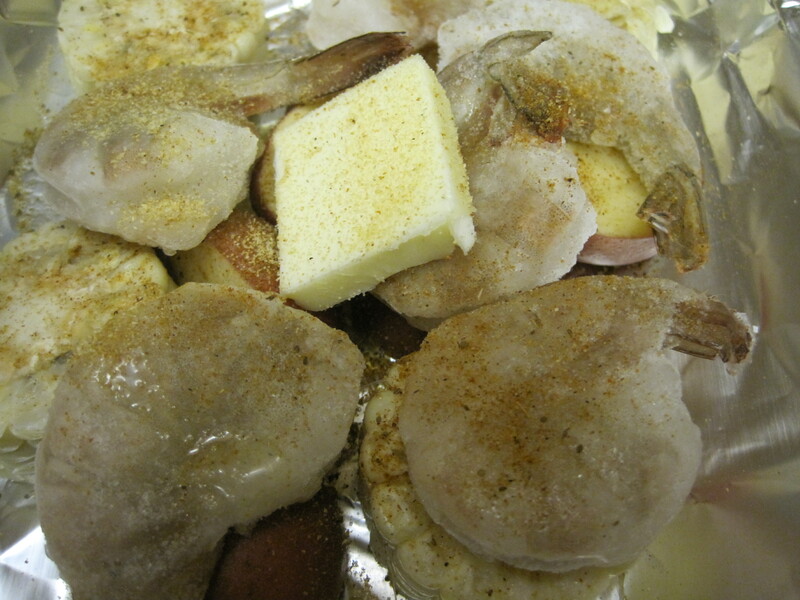 Sprinkle with ¼ teaspoon of Old Bay seasoning and ⅛ teaspoon of granulated garlic on top of the shrimp. Top with 1 tablespoon of butter. Seal foil pouch and set aside. Repeat steps 3 through 9 to make the other 3 pouches. Place pouches on a medium heat grill for 10 minutes on each side. 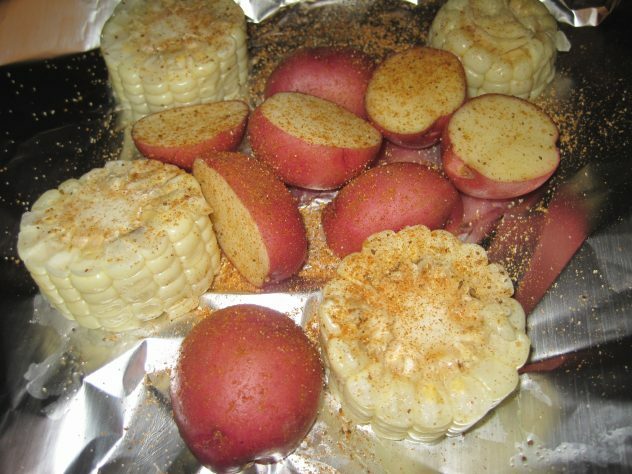 Remove from grill and allow pouches to sit for 5 minutes before opening carefully. These pouches will be full of steam. Take care that the escaping steam does not burn you. These look so good. I’ve made them with chicken in the oven. When it comes to grilling, I’m just not sure about the “medium heat” level of the grill. Sometimes I burn stuff up or under cook it while the tin foil is scorched and nearly incinerated. So do you use your hand over the heat to test for the emperature or rely on a thermometer or what? These are very easy. I leave the grilling to my hubby. I hand him the packets, and he grills them. We have made a few other versions that we will be sharing on the site, too. He really likes foil pouch dinners, but Sue Chef isn’t feeling it. She solemnly asked us whether we are going to do 30 days of foil pouches. I told her that was a GREAT idea. Can you believe that she rolled her eyes at me? I’m with you, Sue Chef. The thought of eating something cooked in foil once in awhile is one thing, but 30 days of it, I’d have to opt out. So, Patti Cake, what is Old Bay spices? I don’t remember ever seeing something of that nature where I shop. And thanks for this recipe, Patti Cakes Pantry Team, I’ll have to give this a try, with modifications, of course. Another eye roller? Guess we’ll stick to one foil pouch per week then–at least for now. Old Bay Seasoning is a commercially prepared spice mixture of mustard, paprika, celery salt, bay leaf, black pepper, crushed red pepper flakes, mace, cloves, allspice, nutmeg, cardamom, and ginger. It’s popular in certain regions of the US. I first learned of it when we had only one child, Bus Boy, and Baker’s Man worked in a sandwich shop that served a delicious seafood salad sandwich that was seasoned with Old Bay. You can usually find it on the spice aisle, or next to the seafood counter in most bigger grocery chains. The can is bright yellow with a red lid and a blue stripe that says “Old Bay” across the top.